Our parent company turned 100 years young this year, and we celebrated with a spectacular, scintillating, centennial tradeshow in New York City. We’re starting our second century in fine form! 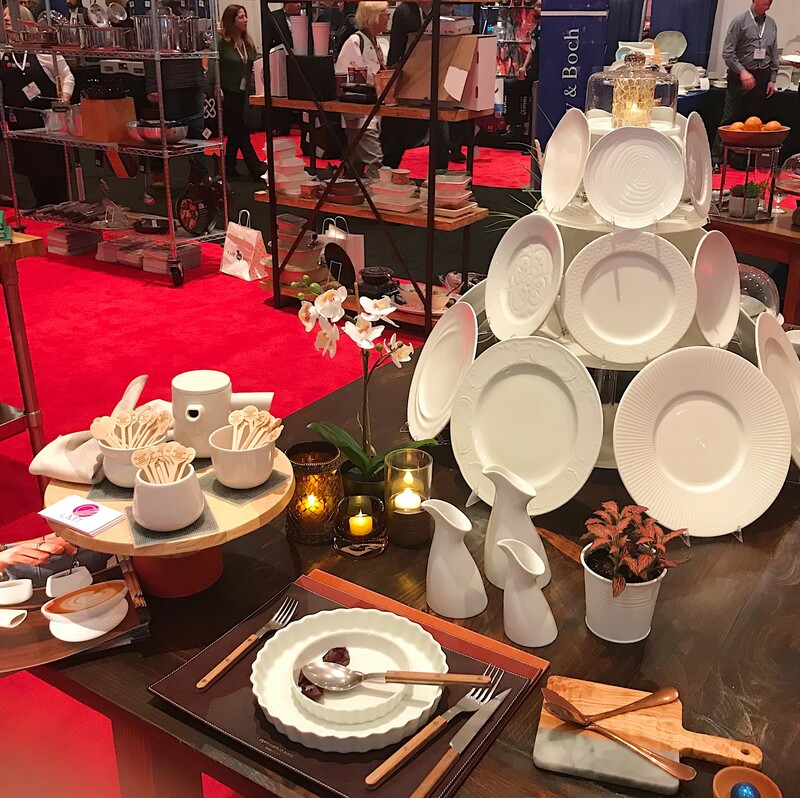 The M. Tucker area had the highest traffic throughout the show, with the most diverse display of tabletop product and vendor partners throughout. Two of our partners were nominated for innovation awards! Figgjo Norway was recognized for their Oslo coffee service – a collection that has already received the prestigious Red Dot Award. Tilit was recognized for their hemp sewn work shirts, which are quickly becoming the standard in restaurant and hotel uniforms. The Hospitality Glass Beehive Bar was a hit—the perfect corner of our booth to hang your hat and admire longtime favorites like Stem Zero, with its sweeping elegance, as well as newcomers that will be coming into stock very soon, like Big Top, a fun, faceted barware collection with a mid-century aesthetic. 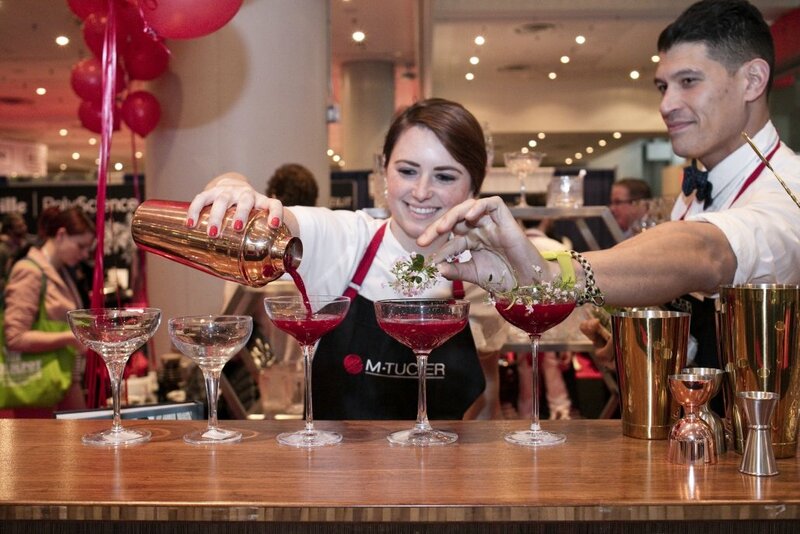 We changed gears this year with themed tablescapes, reflecting potential foodservice concepts from the fanciful to the demure. A Taste of Honey, near our Beehive Bar, was a dazzling collection of gold-rimmed plates and glassware, as well as Goldware, our stocked collection of gold PVD flatware. We simply had to have a pink table too. Think Pink included our newest stocked collection, Chena Pink from Anfora, Figgjo custom dinnerware, hot pink Sabre flatware and Mosser glass accessories. A 100th birthday party calls for a one-of-a-kind cake. Naturally, ours was built out of very special plates. This three-tiered porcelain confection was designed with dinnerware that speaks to lasting heritage, and celebrates some of our newest partners as well, including Crucial Detail, Pillivuyt and Haand Hospitality. It was the climax of our tabletop performance, worthy of a photo finish. When one tradeshow ends, planning for the next one begins. Visit us at Singer’s hallmark centennial tradeshow, from April 15th-16th. For more information, send an email to lmt@singerequipment.com.